Mississauga Festival Youth Choir presented “Our World, Our Stories” concert recently at the Eden United Church. 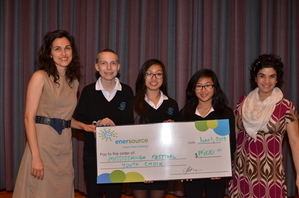 Catherine of Enersource, concert sponsor, presented a cheque to Ana Alvarez and company to open the concert. Children and youth, ages 7-19, wore smiles from ear to ear throughout the event as they swayed and sang a selection of multicultural songs in their native languages. Mississauga Festival Youth Choir is accepting registrations for boys and girls ages 7-19 for Fall 2013. For more information about sponsorships and registration, visit www.MFYC.ca or contact (905) 267-1101.